Contemporary artist, songwriter and surfer, Ithaka, will return to participate in this year’s epic surf art /skin cancer fundraiser event Surfboards On Parade in Orange County, California. Ithaka along with over thirty-five other artists and surfboard shapers was invited to participate on twenty individual art pieces. Some are collaboration between artists and shapers, however in the case of Ithaka of a couple of participants have created their pieces using abandoned surfboards without an assigned shaper. After being on display at high profile sites around Huntington Beach all summer, all twenty surfboard art pieces will be auctioned off at the Night Of A Million Waves Gala on October 7th 2016 with proceeds going local charities. 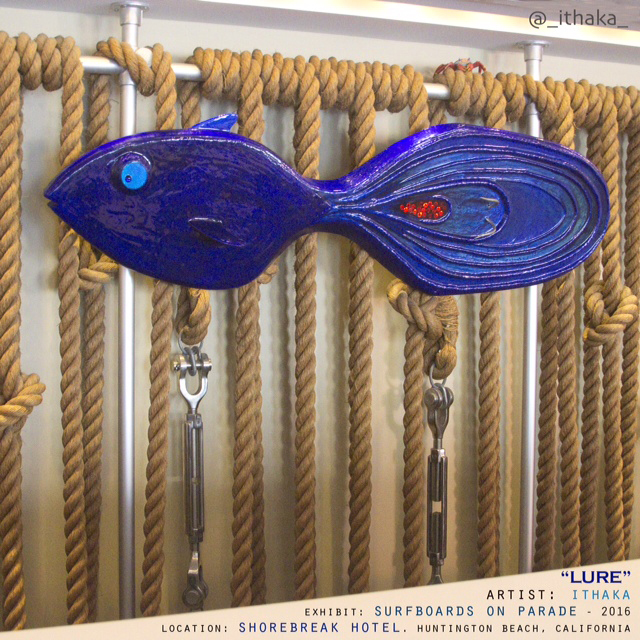 Ithaka is donating the piece entitled, “Lure #6″. Materials: recycled surfboard, rope, stainless steel, acrylic jewels, paints and resin. I’ve been recycling discarded surfboards into contemporary art pieces for about twenty-five years now. There are currently over three hundred wall-mounted sculptures in my ongoing body of work entitled, The Reincarnation Of A Surfboard. Using garbaged surfboards as the base material for the majority of my artwork is a way of continuously connecting to the sea even when I’m on land. Surfing has provided me with an infinite amount of happiness and has fueled my entire life course of aquatic global oceanic wanderings and creative expression. I feel infinitely thankful to have grown up with access to the ocean, specifically Southern California. I sometimes see things outside of the art world that are very aesthetically imaginative but built for practical purposes. Fishing lures are a prime example of this. Since I was a kid, I’ve always been fascinated by lures; the designs, the colors and the materials. Observed closely, they are miniature, master-works of contemporary art. Sometimes we forget that an individual or individuals visually create literally everything artificially made. I’ve often wondered about the persons that conceive these little aquatic jewels. “Lure”, my sculpture appearing in Surfboards On Parade, is an homage to the imaginative but nameless artists who dream them into existence. On June 16th, the designer-shaped and artist-painted surfboards were unveiled at the the Klimpton’s Shorebreak Hotel kicking off the 2016 Surfboards On Parade, an annual event to aid in the eradication of skin cancer. The boards are displayed at various venues around Huntington Beach through October 7, 2016 when they will be auctioned off at the Night Of A Million Waves Gala. Since the boards are not displayed in one setting again until the actual auction takes place, I’ve gathered photos and made composites from various sources so you can take a good look at the one-off surfboards. The shapers and artists of these boards are some of the best known and respected in the surfing industry and beach art community. Many of these do not represent their best work, so be sure to check out some of their other work if you get a chance (google them). The proceeds from the auction will aid in the research, education and prevention of skin cancer. The beneficiaries are the Orange Coast Memorial Foundation and the Rotary Club of Huntington Beach.